Cheap Pop: Make the Tag, USA Network! with a slight historical bend. Recently, Network Television had their version of the WWE’s Black Friday, that infamous post-Wrestlemania day when the WWE trims its Superstar roster. Television opted to cancel a slew of shows: CBS dropped Dramas like Vegas, Golden Boy and CSI: NY along with the “I can’t believe this show is still on” Comedy Rules of Engagement. FOX has been trimming the fat all year long, pulling the plug on the Mob Doctor, breaking up the underrated Comedy Ben & Kate, and finally quarantining Touch. NBC canceled … everything! Well, almost everything: Both Parks and Recreations and Community were renewed! ABC made a lot of sensible decisions, dropping 666 Park Avenue, Malibu Country and anything they aired on Thursdays at 8pm (We watched you, Last Resort). But when it came to their Comedies, we disagree with the cancellation of Don’t Trust The B in Apt. 23 and, especially, Happy Endings. Our hearts broke upon hearing the news that Happy Endings was canceled. Especially since we’ve talked about its wrestling connection not once, but twice. There is a little bit of a silver lining though: rumors say that USA is interesting in picking up Happy Endings, similar to when Cougar Town was picked up by TBS after ABC dropped it. So, here we are, thrice discussing Happy Endings, in the hope to persuade USA to pick up the show. Here are some ideas that have the comedy crossover with the longest running weekly episodic series on television, Monday Night RAW. The Pitch: Tired of Dave using his 1/8th Cherokee ancestry as a defense, the group all take a home genealogy test. When the results reveal that Penny is related to Koko B. Ware (possibly her daughter), everyone thinks there’s a mix-up: clearly, those are Brad’s results, right? Penny, determined to find out the truth and Brad, confident that his dad isn’t the Birdman, track down Koko, who is in town for a WWE event. They discover that Koko is related to someone in the group: Max. @3manbooth I see her more as the daughter of Koko B Ware. @happywrites That’s even better! Penny could definitely rock a blonde flattop and neon pants. Alex calls dibs on Frankie the bird though. The Pitch: Max needs money and signs up to be a member of the”Second City Secret Service.” Naturally, he didn’t read the fine print: he agreed to ‘interrupt’ Chicago’s celebrities in public and get berated – verbally and/or physically – to detract any overbearing autograph hounds. Max’s first client is CM Punk. The two bond when Punk puts Max in an Anaconda Vice after Max ‘successfully interrupts’ Punk’s lunch with best friend / WWE Superstar Colt Cabana (Hey, it’s our Pitch!). Their friendship comes with benefits for the group (free tickets to wrestling shows; portraits by Jill Thompson) but at the cost of Max’s already below standard health. 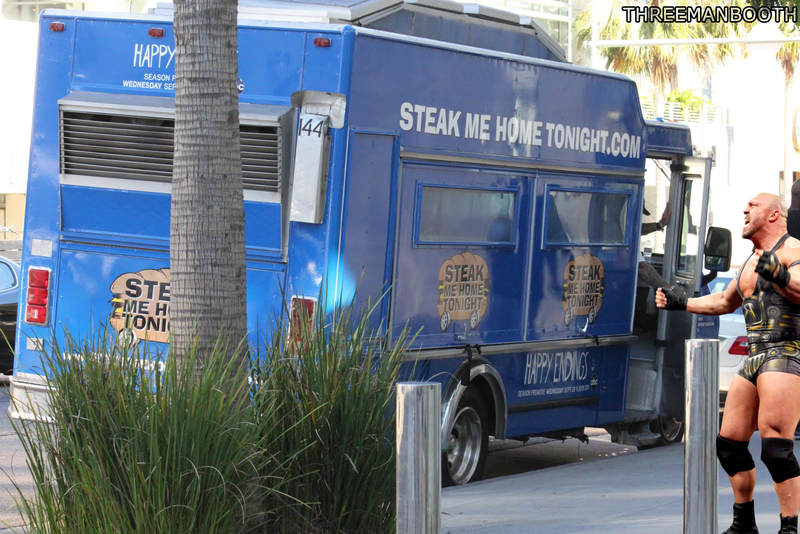 The Pitch: In town for Monday Night RAW, The Ryback finds Dave’s Foodtruck, Steak Me Home Tonight, for lunch. After 10 Steak Sandwiches, Dave is able to quell The Ryback’s FEED ME MORE appetite … for now. The Ryback’s followers – The Rybackolytes – come to Dave’s foodtruck in droves because “Ryback Rules.” Seeing more business (and money) than ever before, Dave agrees to follow The Ryback around the country as his personal chef while raking in dough from the Rybackolytes. The group realizes they can’t function without Dave around (who will they make fun of?) and devise a plan to keep Dave in Chicago: a “Meat on the Table” All-You-Can-Eat Rib Competition against The Ryback. Using their secret weapon, Alex, they defeat him by one rib, mostly because The Ryback filled up on Steak Sandwiches right before the competition. 2. Let’s Make It a Tag Team Match! The Pitch: Brad and Jane declare themselves the best couple in the group (they’re the only couple in the group) and look to prove they are best couple of all time. After entering a nationwide “Perfect Couples” contest, they find themselves in the regional finals against The WWE’s best couple, Dolph Ziggler and AJ Lee. Their intense competition – including rounds like Sexting, Roleplay, Antiquing and Pet Names – comes down to the final round: Board Game Night. Who will emerge victorious? The Pitch: During “Chicago Cares Week,” Penny’s PR firm works with the WWE, causing Penny and John Cena, the WWE’s representative, to be paired up for several events. Penny gets smitten with Cena’s behavior (“He’s so good with kids!”) and tries to turn Cena heel … as her boyfriend. Penny treats all the other charity events into dates: wearing tight dresses, openly flirting in front of the WWE Universe, getting jealous of the WWE Divas (Bella Twins? There’s two of them?!?). Penny mistakes an invitation to the closing Charity Dinner for a date and gets frustrated seeing Cena’s outfit for the night is the same T-Shirt and Jorts. See, USA? Happy Endings is a perfect fit on your network. If this doesn’t work, we have Happy Endings / Psych crossovers too. Spoiler Alert: those will also involve wrestling. This entry was posted in Cheap Pop, I Have Til 5, WWE and tagged ABC, AJ Lee, Alex Kerkovich, Brad Williams, CM Punk, Dave Rose, Dolph Ziggler, Happy Endings, Jane Kerkovich, Jill Thompson, John Cena, Max Blum, Penny Hartz, Psych, Ryback, USA Network. Bookmark the permalink.